Savitt, Ronald and Dennis Johnson. "Retail Trade". The Canadian Encyclopedia, 04 March 2015, Historica Canada. https://www.thecanadianencyclopedia.ca/en/article/retail-trade. Accessed 18 April 2019. There are 2 broad categories of retail-trade organization: retail chains, which operate 4 or more stores in the same kind of business under the same ownership, and independent retailers operating 1 to 3 stores. 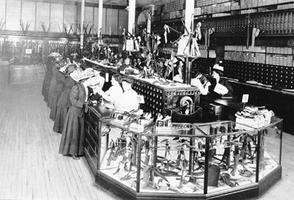 The interior of the store in 1911 (courtesy Maclean's). Retail trade is the sale of goods or services to consumers for personal or household use. Consumer spending through the retail trade accounts for 60% of the Gross Domestic Product of Canada and employs over one million people. Statistics Canada recognizes some 206 300 retail outlets in Canada, primarily shops, car dealers, supermarkets and department stores, but the number does not include street vendors, farmers' markets, roadside stands or the growing UNDERGROUND ECONOMY. There is also a great variety in the methods by which the selling takes place: over the counter, by vending machines, door-to-door or telephone canvassing, mail order and others. In 1991 Canadian retail sales totalled $194 billion, with Alta (at $7650), BC (at $7377) and Ontario (at $6775) the leading per capita spenders. Ontario remained the largest market (37%); Qué (24.4%) and BC (13.2%) followed. There are 2 broad categories of retail-trade organization: retail chains, which operate 4 or more stores in the same kind of business under the same ownership, and independent retailers operating 1 to 3 stores. By Statistics Canada definition, all department stores are chains, and chains dominate variety stores , family shoe stores and general merchandise stores. Over 95% of national sales by garages, used car dealers, motor vehicle dealers and florists are made by independent retailers. There is, however, an increasing proportion of independent retailers operating under franchises. These franchising arrangements allow the independents to gain the economies of scale in buying and marketing power that have traditionally been the strength of the chains. Some of the largest corporations in Canada are retail chains. For example, Sears Canada, Loblaws, Steinberg, Hudson's Bay and Safeway Canada are among the top 30 corporations. By 1991 it was estimated that the 1106 chains in the country controlled about 38 650 stores accounting for over 40% of all retail sales. The largest chains (100 or more stores) account for almost one half of the chain stores in the country, and for 50.1% of the chain store sales. Most of the largest chain organizations are headquartered in either Toronto or Montréal. Department stores are huge emporiums selling a wide variety of goods. The T. EATON CO. LTD. of Toronto (fd 1869) was one of the first stores anywhere to offer a wide variety of goods on a large scale, and along with Simpsons it initiated mail-order sales in Canada. Statistics Canada distinguishes major (&QUOT;traditional&QUOT;) department stores from junior department stores, the latter selling the same wide range of goods as major department stores, but are popularly described as discount operations. The junior department category does not include all discount operations. Of the 312 major department stores in Canada in 1994, 188 (60%) are in the 10 largest metropolitan areas. Traditional department stores in the 1980s were experiencing a loss in market share to discount operations who offered lower prices and more flexible financing for such items as furniture and appliances, and to specialty retailers who offered better quality service. The HUDSON'S BAY CO, with its subsidiaries Fields, Marshall Wells and Simpsons, had over $5.4 billion in sales (1993), employed 69 000 and ranked 31st among Canadian corporations. The HBC, Sears Canada ($4 billion in sales) and The T. Eaton Co (sales not available) have a combined traditional department store market share of about 75%. The first hypermarché, or superstore (over 3500 m2) opened in Montréal in 1973. Since then the Canadian Superstore and Safeway's Food for Less operations have begun to penetrate the Canadian suburban retail landscape. Direct selling, the majority of which takes place through personal selling (29.5% of direct sales in 1992), mail order (29.3%) and other methods (41.2%). Cosmetics and personal care items account for 22.5% of personnel selling channels, while books and encyclopedia sales (30.9%) and magazines (23%) are the leading products sold through mail order. Newspapers (47.4%) are the dominant items sold via home delivery, while dairy products (44.3%) are still important. In 1992 there were 660 vending-machine firms with 165 972 machines in factories, institutions, offices, hotels and restaurants. Sales amounted to $480 million, of which 25.8% was coffee, and 25.3% soft drinks and 19% cigarettes. Retail prices are used to calculate changes in the cost of living. The CONSUMER PRICE INDEX (CPI) measures percentage change over time in the cost of purchasing a constant or equivalent &QUOT;basket&QUOT; of goods and services typical of a particular group of private households - both families and individuals - living in cities of 30 000 or more in a specific period. Food, housing, household operation, household furnishings and equipment, clothing, transportation, health and personal care, recreation and similar activities, tobacco and alcohol are included in the index. The index is usually stated in relative terms, 1986 being equal to 100. The index has increased by about 16% in the past 7 years (from 100 in 1986 to 115.7 in 1993). Retail trade in Canada is increasingly taking place in planned shopping centres. A shopping centre is a group of retail stores and consumer service outlets (usually 5 or more) which are operated separately but occupy a single property and are managed by a single firm. These centres range in size from neighborhood centres and newly emerging &QUOT;strip malls&QUOT; (5-15 stores) to community centres (16-30 stores) to regional centres (more than 30 stores). It has been estimated that shopping centres account for some 40% of all retail sales in Canada. Although there is a greater number of neighbourhood and community shopping centres in Canada (987 centres or 89%), the regional centres have created the greatest impact on the urban landscape. WEST EDMONTON MALL, with some 800 stores and a gross leasable area (GLA) of some 483 000 m2, represents Canada's entry into the &QUOT;megamall&QUOT; category. This mall, the largest in the world in 1988, also represents the extreme example of a trend towards mixing retailing and recreational activities in a controlled indoor environment. About one-quarter of the GLA is hotel or recreation and entertainment use. Shopping centres have been the main agents in the decentralization of retailing activities to the Canadian suburbs. A retailer in a shopping centre must learn new management skills and conform to the behaviour of retailers in the centres. The growth of shopping centres has had and will continue to have a direct impact on small independent businesses that are unable to compete or thrive within them (see SMALL BUSINESS). Shopping centres have also affected the variety of choice by excluding many of the smaller retail establishments. Not all planned shopping centres are in suburban locations. Most Canadian cities have one or more major planned shopping centres, usually a mix of office and retail uses, in their downtown areas, PLACE VILLE MARIE in Montréal and EATON CENTRE in Toronto being early developments of this type. Shopping centres across Canada resemble one another because of the concentration of developers involved in their construction, and the dominance by major national chains. An estimated 34 development firms control 454 shopping centres in Canada and over 60% of the retail floor area. National chains may account for an estimated 75 % to 90% of tenants in large shopping centres. Retailing in Canada is a major source of employment, although retail positions are generally poorly paid. Despite the general strength of the labour movement in Canada, attempts to organize retail workers in any systematic way have been quite unsuccessful. This is partly because of the nature of retail jobs, which do not require highly developed skills, and because of the transience of retail employees. But it is also a consequence of efforts by major Canadian retailers to discourage UNIONS. With the shift to self-service and open stores, the role of retail employees has generally been reduced to taking orders. Major retailers are currently implementing new systems to increase labour productivity, including centralized &QUOT;cash-points&QUOT; and computer applications throughout store operations. The retail employment pool is one of the most fickle. Students, younger women and older people move in and out of the retail trade in response to economic needs in general and to seasonal needs, eg, extra money for Christmas. Often neither time nor resources are available to develop a trained selling staff. Other jobs in retailing include buying and merchandising, store operations (especially those related to operation and maintenance of the physical plant), personnel management, accounting and control of operations. Despite the trend toward bigness, retailing is still an area where individuals can gain a foothold in business. It has been a traditional means by which many immigrants have established themselves. The retail store often provides employment for the family while simultaneously serving specific markets. These establishments will always be important because of their flexibility and their ability to respond to particular market opportunities. They will always offer substantial competition to the larger, more sophisticated, types of retailers. Choosing a product assortment and displaying it, establishing a price level, developing a promotional program and creating a store &QUOT;image&QUOT; are 4 aspects of merchandising. Regulation of retail trade not only protects the consumer from unfair merchandising practices, discriminatory prices and unfair and misleading promotion and advertising, but also encourages competition among retail firms (see COMPETITION POLICY). The federal Combines Investigation Act theoretically regulates agreements, eg, mergers, among competitors, and restrains trade among retailers. Under the Act misleading price advertising is illegal. The Act is administered by the Dept of Consumer and Corporate Affairs, which is responsible for problems arising from misleading advertising and hazardous products, and for packaging and labelling. The department, along with similar provincial agencies, develops and distributes materials designed to help consumers become more informed shoppers. Individual provinces have also passed consumer protection laws regarding selling practices. Two of the most comprehensive Acts concerning retailing are found in BC and Québec. The Deceptive Trade Practices Act in BC lists 18 deceptive practices and is designed to curtail the &QUOT;sharp&QUOT; practices of sellers; the Québec legislation passed in 1971 includes provisions aimed at preventing advertising directed toward children and gives consumers the right to inspect and obtain credit records. The general principle of caveat vendor (&QUOT;seller beware&QUOT;) holds in Canada, ensuring that retailers are cautious in the development of specific merchandising activities. Retail trade in Canada developed along relatively specialized product lines, replacing the trading posts or general stores which had characterized retailing until the turn of this century. Single-line stores, particularly in population centres, developed for specific product groups such as drugs, food and hardware. Other areas were and still are to some degree served by mail order. In the last 20 years stores of all types have begun to practise mass merchandising in a movement toward high-volume, low-margin operations. Supermarkets began to sell, along with food items, a range of products including automotive supplies, clothing, hardware and pharmaceutical items. Department stores began to sell automotive accessories and repairs, &QUOT;health foods&QUOT; and services such as banking, insurance and travel. Discount operations in Canada offered a wide range of products - in contrast to those in the US which offered only narrow lines - and also expanded service operations. The control of the market by a limited number of firms is increasing. In general merchandise, the HBC controls about 11% of the market. In department-store sales, the HBC (with its subsidiary Zeller's), T. Eaton Co and Sears Canada Inc have a combined market share of more than 75%. The same concentration exists in food retailing. The 5 dominant food chains - Loblaws, Dominion, Canada Safeway, Steinberg's and A & P - control about 60% of the market. Retail trade is subject to fluctuations and change. In both the general merchandise and food areas, new competition appears to be coming from specialty stores. While the appearance of superstores has created massive units offering a variety of food and nonfood items, independents are gaining a foothold by acquiring conventional supermarkets and developing product mixes that cater to fragmented and specialized local markets. Television and telephone shopping is now a reality in Canada, and catalogue shopping has made inroads in the upscale markets. Canadian developers and retailers are also active in the US; 5 of the major Canadian development companies directly and indirectly own about 6 million m2 of retail properties in the US (this amounts to just under 1% of total US retail space). Canadian developers are exporting expertise in shopping centre development and renovation. Sunday and evening shopping are making inroads in most provinces. This change complements the increasing blending of shopping and leisure activities, a mix that has retailing experts wondering how these activities really complement each other. The rapid growth in the variety and sophistication of consumer demand is affecting retail change, as are shifts in population and even tourism. Patterns of consumption vary across Canada; in provinces such as Alberta and BC, where population and income increased in the 1970s and early 1980s, more money became available for retail purchases, and even though recent trends have resulted in overbuilding of retail space new developments and renovations persist. Patterns vary also according to age and the number of children; younger people tend to be more receptive to new products and new forms of retailing. Within Canada expenditures are influenced by ethnic diversity and even by the weather. Sears CanadaThe official corporate website for Sears Canada Inc.